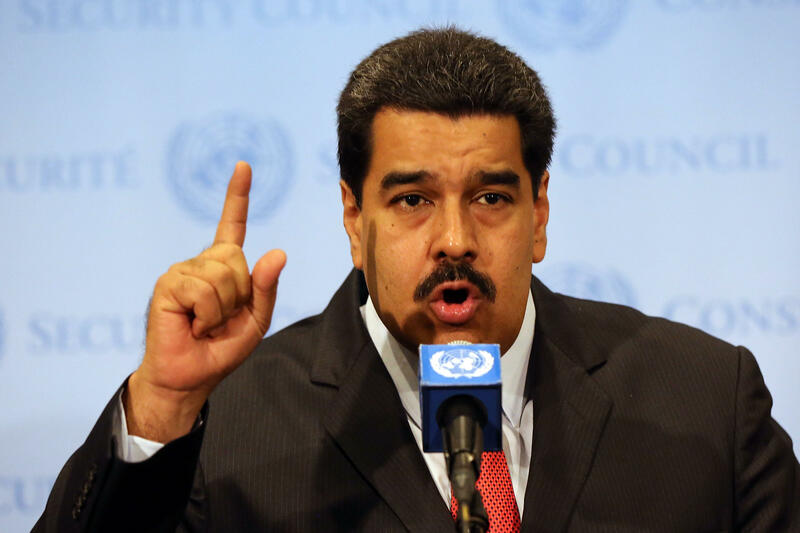 CARACAS, Venezuela -- President Nicolas Maduro said a police helicopter fired on Venezuela's Supreme Court on Tuesday in a confusing incident that he called a thwarted "terrorist attack" aimed at ousting him from power. The exchange took place as Maduro was speaking live on state television to pro-government journalists. More than hour after the flyover ended, he told the audience that the helicopter had fired on offices of the court as a social event was taking place and launched a grenade that didn't explode. He said the nation's air defense was activated, preventing any loss of life. "It could've caused a tragedy with several dozen dead and injured," said Maduro, who sounded alternately calm and angry as he told the audience about what had happened in the airspace just beyond the presidential palace where they were gathered. Associated Press reporters heard what sounded like loud gunfire as a blue helicopter buzzed through downtown around sunset but was unable to confirm where the explosions were coming from. Meanwhile many of Maduro's opponents on social media accused the president of orchestrating an elaborate ruse to justify a crackdown against Venezuelan seeking to block his plans to rewrite the constitution. Venezuela has been roiled by anti-government protests the past three months that have left at least 75 people dead and hundreds injured. Adding to the intrigue, pictures of a blue police helicopter carrying an anti-government banner appeared on social media around the same time as a video in which a pilot for the police squad, identified as Oscar Perez, called for a rebellion against the Maduro's "tyranny" as part of a coalition of members of the security forces. "We have two choices: be judged tomorrow by our conscience and the people or begin today to free ourselves from this corrupt government," the man said while reading from a statement with four people dressed in military fatigues, ski masks and carrying what look like assault rifles standing behind him. Later, Venezuelan Information Minister Ernesto Villegas said a stolen helicopter fired 15 shots against the Interior Ministry as a reception was taking place for 80 people. It then flew a short distance to the pro-government Supreme Court and launched what he said were four Israeli-made grenades of "Colombian origin," two of them against national guardsmen protecting the building. Authorities said there were no injuries from Tuesday's attack and that the area was still being surveyed for damages.